In 2003 IB-Vision developed, by order of Inforwarding B.V., the airfreight rates database Afra ( http://www.airfreightrates.aero). 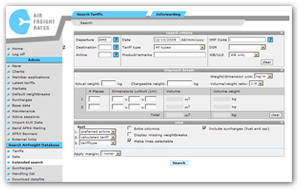 This application facilitates the communication of airfreight rates between airline companies and forwarding agents. The airline companies publish their airfreight rates, the forwarding agents can easily look at and compare the rates. Besides its basic function of rates management, Afra encompasses a great number of practical functionalities, such as simple distribution and linkage to reservation systems. Afra was first put into action in The Netherlands and Belgium, but then soon came into use worldwide, first under OAG, later under UBM Aviation, with virtually all airline companies across the world and all leading forwarding agents. IB-Vision has not only developed the application, but is also responsible for the maintenance. IB-Vision makes sure that the system continues to function correctly, since many hundreds of users log in every day, in order to consult the database of millions of rates. Also various linkages are being kept between Afra and internal systems of airline companies. There are, for example, linkages with Air France/KLM, American Airlines and United Airlines. 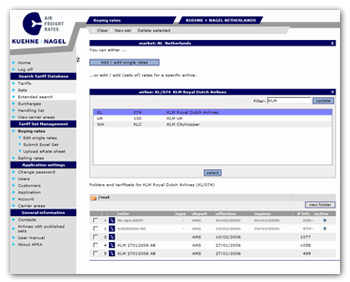 As Afra’s spin-off, IB-Vision has developed a special version for Kuehne+Nagel. This leading global forwarding agent (top 5 of leading forwarding agents) uses the software for keeping the buying rates up to date. The rates of airline companies around the world are being placed in the database in a simple and unambiguous way. The application is linked to K+N’s existing reservation software. 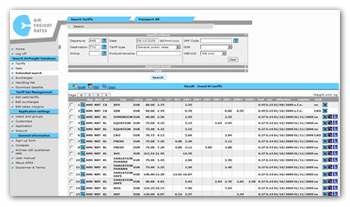 In 2008 and 2009, IB-Vision developed a completely new version of the airfreight rates database. The first copy of this new generation has been provided to Martinair, by the name of Martinair Cargo Rates (MCR). 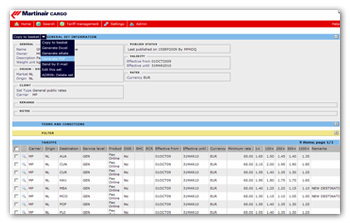 Martinair uses MCR to manage all sales rates in a simple, unambiguous and structured way. Furthermore, this application offers all sorts of possibilities for distribution, analysis and supervision. All this leads to considerable saving of time, decrease in mistakes and because of that, an increase in quality and consistance.